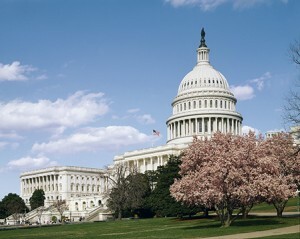 U.S. Capitol Building. 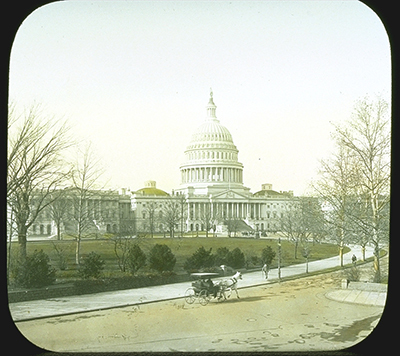 Photo by the Library of Congress. By early December 2014, a Congressional election year, newly elected Members of Congress were preparing for public service as outgoing Members were ending their public service and attending exit briefings. At an event sponsored by the U.S. Association of Former Members of Congress, the December 3rd “Life After Congress” seminar, Robin Reeder, Archivist of the U.S. House of Representatives, offered records management advice to each of the thirty or so Members of Congress in attendance. She talked to them about best practices for saving both textual and electronic records, about deeds of gift and transferring records to a repository and how these steps help preserve the legacy of their service in Congress. House and Senate rules define official records as any records, regardless of format, that are created or received in the course of the business conducted by congressional committees. These official committee records are eventually transferred to the National Archives and Records Administration where they are preserved as the historical record of the work of Congress. In contrast, the rules designate the papers of a Member’s congressional office as being outside the scope of official records. Member’s maintain ownership of records created in the course of their congressional service, are responsible for effectively managing them, and determine the ultimate disposition of these papers. Member’s papers comprise both textual and electronic records and include things like personal notes, legislative research files, photos and correspondence with constituents. Setting up file systems – paper and digital. File organization and naming conventions. Setting up an “Archive” folder on a shared drive in which to archive digital documents. Ultimately the archivists would like Congressional staff to manage the Congress Member’s personal digital files in a way that will be useful both now and down the road when she or he leaves office. “We do recommend that there be one person on staff who is in charge of records management so that there’s one person making the decisions about how to save things and what formats in which to save things,” said Heather Bourk, Assistant Archivist of the U.S. House of Representatives. Bourk concedes that many new Members of Congress are usually just trying to manage the immediate demands of their work and the massive amount of information that cascades through the office, while preserving a Member’s legacy becomes a secondary concern. In the daily Congressional workflow, digital records management can have a higher priority than digital records preservation. “Our primary role is to provide guidance on how to preserve records for the long term and ensure future accessibility,” said Bourk. “But we often just get a lot of questions about how to manage current files.” The archivists hope that digital records management and preservation will become equally important. The U.S. Capitol building, 1827. The Frances Loeb Library, Harvard Graduate School of Design. If the Member of Congress does not have a destination in mind for the digital files — a library or educational institution, a state archives or historical society or a center — the archivists want to make sure that the files are at least well-preserved for the time being. Ideally, when the files are transferred to a research repository, a professional archivist will take over the digital curation. The U.S. Association of Former Members of Congress — an organization whose members donate time for public service after they leave Congress — also tries to help members transition off of Capitol Hill. The increasing urgency of proper digital preservation has become apparent to the U.S. Association of Former Members of Congress in recent years and they, too, want to ensure that Members of Congress get the most comprehensive advice available about preserving personal digital files. The U.S. Association of Former Members of Congress, like the House and Senate archivists, would like outgoing members of Congress to manage their digital files wisely while in office and leave office with those files “archive ready.” Together with the National Archives and the archivists of the House and Senate, the U.S. Association of Former Members of Congress gathers information about best practices. There is not much a Member of Congress can do about file formats though, except — when using software that is not widely used by their peers — to be aware that there may difficulty accessing those files in the future. When in doubt, Members and their staff can consult the archivists of the House and Senate for advice. Popular software — software that is widely used — has a larger base of stakeholders and so stands a better chance of accessibility in the future than little-used or obscure software. For example, members of Congress can export email from their Microsoft Outlook accounts as PST files, an “open proprietary” format that trained digital archivists can convert to other formats. Other formats are not so convertible. Senator Byrd also used a constituent correspondence management system, which is still used by most Members of Congress. The system enables Congressional staff to manage the correspondence between citizens and Member of Congress, and track and tag emails — along with memos and calendars — and sort it all into topics. Since the system is proprietary, it exports Members’ files — and all of the files’ complex data relationships — in a proprietary format accessible only by that system (although its creators recently enabled the export of a narrow slice of that data into MS Access files). The Congressional Papers Roundtable, a Society of American Archivists working group, continues to explore possible solutions for enabling Members of Congress to export all of the constituent data from that system into a system-agnostic format, so digital archivists at Congressional research centers can restore it within their own systems. Smock said the correspondence itself, in and of itself, is historic. “It’s great for telling the story of a district or a state because you are hearing directly from the people who live there,” he said. Eventually, Weichlein’s group issued a two-page tip sheet (PDF) that addresses essential steps and basic best practices for organizing and backing-up digital files. The tip sheet also goes into detail about scanning (based in part on input from the Federal Agencies Digital Guidelines Initiative) because scanning documents is still a great task for outgoing Members — not all of their digital files are born digital — and the U.S. Association of Former Members of Congress wanted assurance that Congressional staff could be directed to scan paper photos and documents correctly. “We hope to guide people to a more orderly transfer of their material when the time comes,” said Bourk. This is a syndicated post. Read the original at The Signal: Digital Preservation 2015-04-27.